Home Breads SANDWICHES ARE BACK! I’ve eaten more real, honest-to-goodness sandwiches in the last month than I have in the last 15 years! 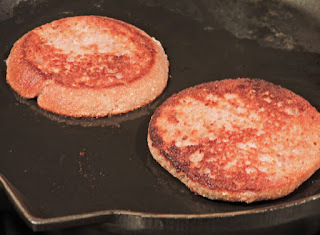 My last post featured the recipe for the low-carb, gluten-free, flax-free buns that brought back the good ole days of quick, convenient lunches without cheating! The trick to making a grilled sandwich out of one of my buns is to cut it into three pieces. All the bakers among you probably already know how to get thin, even slices, the way you do for making multi-layer cakes, but for the rest of you, here’s how to do it. 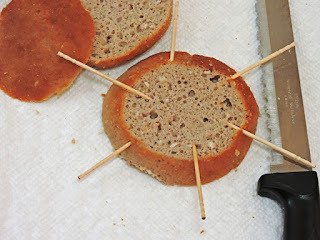 Take several wooden picks and place them around the outside of a bun about 1/3 of the way up from the bottom. 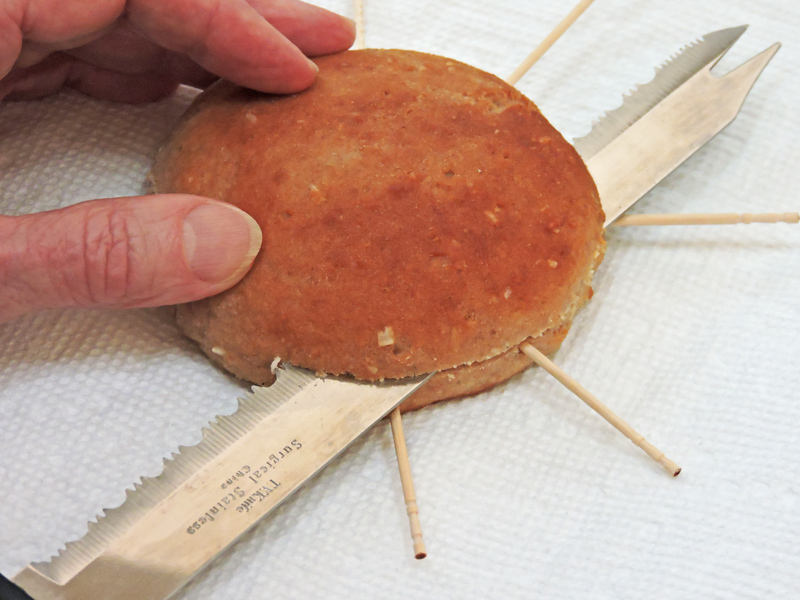 Rest a serrated knife on the picks to keep it level as you carefully saw though the bread. Preheat a skillet and grill the slices on both sides in lots of butter or bacon fat until brown. Watch carefully, as bread made with nut flour will burn faster than regular bread. What kind of sandwich do you want to make? A Reuben with corned beef, Swiss cheese, saur kraut, dill pickles, and Russian dressing (or mustard) would be terrific. Caraway seeds can be used as an add-in when making the buns or sprinkled in the pan before grilling the bread for an authentic taste. For a grilled cheese, grill the bread slices in butter and add Cheddar cheese to one. Top with the second slice, turn sandwich, and heat until cheese is melted. Serve with sugar-free sweet pickles. I’m estimating that slicing off the domed top of the bun will reduce the nutrition counts by about one fourth, since the top is smaller than the other two slices. So the bread for each sandwich would have 7.5 grams of Total Carbs and 4.5 grams of Fiber for 3.2 grams of Net Carbohydrates instead of the 4.1 in the whole bun. It would be half that if you make open-face sandwiches. 14 grams have 4 Calories and no carbs, fat, or protein. Nutrition Data for sandwich will vary with filling choices. DisRAINBOW MIX MICRO-GREENS Photo from: www.brightfresh. Many grocers and produce stands now sell mixtures of sprouts and tiny leaves like the Micro Rainbow Mix shown below. 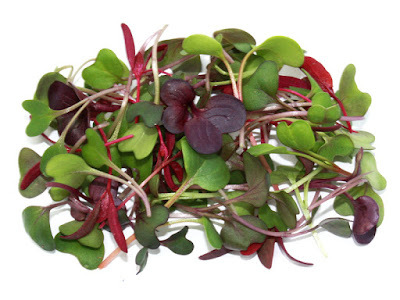 This one is from BrightFresh™ and it contains: arugula, broccoli, amaranth, beet tops, parsley, radish, and others. They are grown in bright natural sunshine in San Marcos, CA, not factory-farmed with unnatural, artificial lighting in a warehouse. Disclaimer: I have not recieved free products or compensation from the company mentioned in this post. 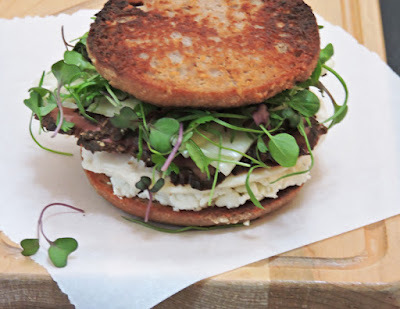 Deli Meat, Goat Cheese, Micro-greens, Sandwich. Bookmark. I just started a low carb diet plan and have lost about 15 lbs in 3 weeks. I like your recipes and find them tasty and interesting. one of my concerns is reading lables about carbs. For instance on Atkins Endulge bars they advertise 2 net carbs, yet when I read the label there is 17 grams of carb 3 g fibre and 9 g of sugar alcohols. So how does that add up to grams of net carbs as per their advertisement.